← Good horn, good brakes, and Good Luck. What an early start. Up at 5.40am for the opening at the Taj Mahal at 6.30am. But for the first time ever at one of these “see the sun rise over … ” monuments, we were first in the queue. Only a 40min wait for opening. We passed the time chatting with a young Indian soldier as he casually swung his machine gun around. I was a little bit nervous when his mate dropped his gun on the ground, but if you check the papers, no Australian tourist was killed in Agra today. This early morning reverie gave us the opportunity to not only watch the golden light of the morning spread across the white marble dome of the Taj, but also the privilege of quiet time alone inside the Taj. 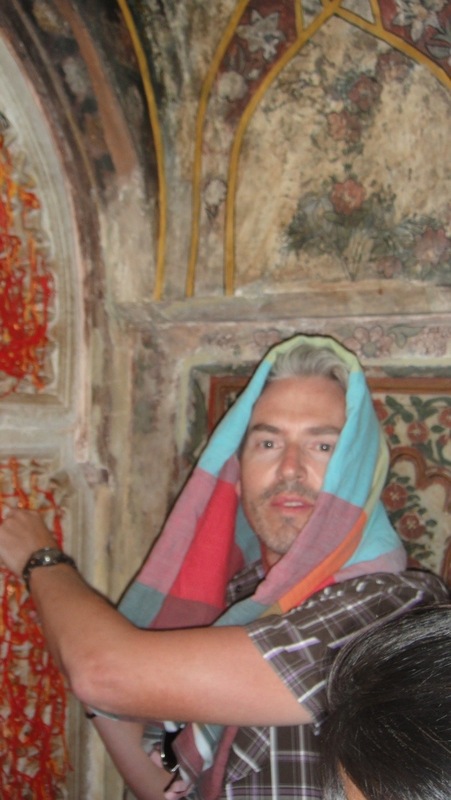 Mike and I were alone inside the Taj, under the marble dome. 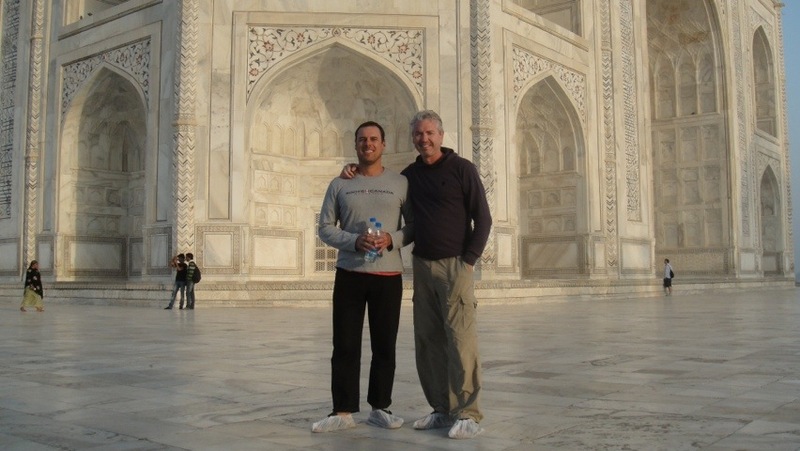 Us, and the two tombs of Shah Jahan and Mumtaz his third wife. She died giving birth to her fourteenth child. Ladies, I agree. I think she deserved a memorial like that after so much time in the labour ward. So it was just the four of us (oh and about twenty pigeons), with the sound of the wind blowing through the intricately carved marble screens and the pigeons cooing. These soft sounds echoed all around us. The sun was slowly creeping into the tomb and rebounding off the white marble and illuminating the patterns made of semi-precious stones that were inlaid into the towering arches and walls around us. Ok I’ve said it. I was trying not to use that word, but it is the only way to describe the time we spent alone in the mausoleum, while the hordes or tourists poured into the Taj gardens busily taking photos from the outside. So an early morning Chai on a rooftop overlooking the Taj and now we are off to meet our driver to continue our guided tour of Agra. Maybe it wasn’t such a scam; it’s been great so far. The tour took us for a crazy taxi ride into the surrounding countryside to Fatehpur Sikri. The journey out was eventful with our Toyota Corolla breaking down. The smoke coming out of the dashboard was a clear sign things were not good. But after bypassing those annoying little fuses with a bit of wire everything was fixed. Although the smoke did reappear a couple more times. What are those fuses for anyway? Oh yeah, and there was some sort of crash on the highway. This resulted in an interesting detour through the dirt roads of the surrounding countryside. We and about twenty other vehicles of various description drove along ox paths, through fields and straight through a village. They’ll be talking about that day for years to come. I’m sure peak hour in this village normally only consists of a bike, camel and the odd goat. On to Fatehpur Sikri. This is a forted city of the Great Akbar, “Noble father of the world, Shelterer of Knowledge, Greatest Warrior”, basically “the Main Man” of the 1500s. He built this red sandstone city and palace on the top of a hill overlooking the dusty desert all around. One side was fortified, and on the other he ordered a lake to be built, around 2 sq km, filled with crocodiles. He had a Christian wife, Muslim wife and Hindu wife, each with their own palace in the grounds of Sikri. However, Akbar was a very smart emperor. The palaces were designed so he never met with more than one wife at a time. So each felt special and treasured. In part of the grounds of Fatehpur Sikri is a Mosque of great significance, where you buy a piece of fabric and piece of coloured string from a descendent of the holy man who blessed Akbar’s Hindu wife with a son (thus guaranteeing her position as #1 wife). The ritual involves walking clockwise around a tomb, presenting the fabric to the priest, and tying the string around a marble lattice screen whilst making three wishes. It felt like a scam, as it was the most expensive fabric we’ve ever bought. Mike took the holy challenge. Watch this space to find out if it was a scam or not. I don’t know what Mike wished for, but we’re still not rich, and world peace hasn’t miraculously occurred. As Akbar was a busy ruler, he passed on the judicial duties to his favourite elephant. Babar the elephant* acted as judge and executioner; unfortunately for many of the people he passed judgement upon, the legend goes that this elephant was completely insane. Oops. Akbar makes Zimbabwe’s Mugabe look like a Saint and Rhodes Scholar. However, the architectural legacy he left, including the incredible water gardens, is amazing. Unfortunately, the lake dried up and he had to move his capital to Agra, where his grandson built the Taj Mahal. Don’t know what happened to all the crocodiles? There you go – a bit of an Indian history lesson. The scam came to fruition during the final hours of the tour when we were driven around a series of shops selling carpets, jewellery and marble at ‘incredible’ prices. Sorry girls, no sale in the jewellery shop. We already have enough carpets, but who would have known that Mike had a hankering for a white marble table with inlaid lapis lazuli stones and mother of pearl. I was bowled over by his sudden impulse for marble, as he had entered the shop with his arms folded and “no sale” written across his face. Yep, DHL will soon be delivering (we hope) one very expensive (but beautiful!) occasional table. *Any resemblance to wonderful, loving French childrens’ storybook elephants is purely coincidental and a consequence of the artistic licence of the author. This entry was posted in India and tagged Fatehpur Sikri, Taj Mahal. Bookmark the permalink.